I am in love with single hop IPAs at the moment. As a homebrewer I want to learn what each individual hop contributes to flavor and aroma so that I know which hop to use when I’m trying to target a certain flavor. I just brewed my own single hop IPA with Mosaic hops that I’m really excited about. This beer pours a nice golden color with a white head. The label describes the hop variety as “mild” and it certainly is. Nothing over powering in the flavor or aroma. The aroma is grassy and earthy and a little floral. The flavor starts with some malt sweetness and then a nice floral hop flavor. Nothing strong, but nice and smooth. Extremely drinkable. The bitterness lingers in the finish, but it’s not strong or unpleasant. Beyond that the finish is very clean. Rating: 4 (of 5) stars – Pleasant and refreshing. Well done IPA. The other two in this series I’ve tried were the Ahtanum and US Fuggle, but I didn’t take detailed notes for those. I didn’t rate the Ahtanum, but I gave the Fuggle IPA 4 stars also and noted it was “Some floral, some citrus”. Brannon’s Brewpub is a relatively new entry into the brewpub market in the greater Portland area. Located in Beaverton I haven’t had a chance to visit their location, but one of their beers (along with the one they collaborated with) was a guest tap at Culmination. This beer pours a dark but brilliant red and is fairly clear. The aroma has that sweet malt smell, that to me reminds me of cotton candy. I haven’t yet figured out where this smell comes from but my best bet is from the heat treated sugars in Caramel/Crystal type malts. The flavor starts with a little bit of malt sweetness and then quickly shifts into a strong hop bitterness of a classic Northwest style red. The Brannon’s website says they use a lot of rye in this recipe but I don’t recall a lot of the characteristic rye spiciness, but I also wasn’t expecting it so I may have attributed it to the hops. The beer finishes clean with some lingering bitterness. Rating: 4 (of 5) stars – Certainly good enough to make me want to try some of their other offerings. Well, it’s official now. I’ve paid my entry fee and booked my flight for the 2015 AHA Homebrewers Conference in San Diego. I’ve been to a few large industry conferences before, so I have an idea of what to expect, but since this is a hobby conference I imagine it will be a bit different. There are equipment displays and seminars that I’m really excited about but there’s also homebrew club showcases and parties and social events. I’m really excited, it seems like it’s going to be really fun and I hope to learn a lot from the seminars and the other attendees. Stay tuned for updates when the conference rolls around. I was cutting across town today between two homebrew shops, one to pick out ingredients and one to drop off my samples for an upcoming competition. It turns out there was no straight shot between the two and I ended up weaving my way all over and around Inner SE Portland. 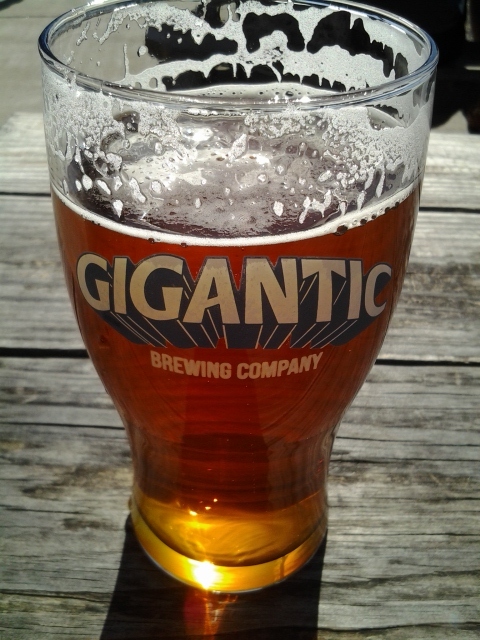 However, on the way I discovered the location of Gigantic Brewing on 26th and Steele. I had tasted their beers at festivals but never visited the taproom. Right now they have six of their beers on tap, plus a Cider Riot cider. Here is a list of what they have at the moment. The one that caught my eye was the Catch 23 Experimental Hop Pale Ale. It doesn’t list the hop variety, but with a name like X-235 would be all but meaningless to anyone but the most serious hophead. Appearance: A nice golden yellow color with a long lasting white head. Nice lace in the glass. Really great looking on the outside patio in the sun. Check it out! Rating: 4.5 (of 5) stars – Really incredible, well made pale ale with all kinds of fun hop flavors and aromas. I think this experimental strain will soon have a name and make it’s way into production beers. I mentioned this beer in the previous post about OCB but my wife brought home a growler of it last night so now I can sit down and do a full tasting note. This beer pours chocolate brown, but crystal clear which is interesting for a “dark” beer, but since this is actually a pale ale, it fits. I wish I could remember how much chocolate they said they add to the beer, but it is actually added chocolate as opposed to malt derived. Off-White to tan head which is lasting and leaves a nice “lace” on the glass. Aroma is mostly chocolate with some malt sweetness. Flavor starts with malt sweetness offset with a small amount of hop bitterness. Chocolate flavor really pops in the finish after you swallow and then that fades into a light hop bitterness that lingers quite a while. This is honestly a really bizarre beer, and yet it’s incredibly enjoyable. You don’t expect that flavor out of an IPA/Pale Ale style beer so it really throws you for a loop. Rank: 4 (of 5) stars: Really unique and well made.